For Toronto hockey fans born before 1980 or thereabout, Wendel Clark is as close to godly as a Canadian is likely to come. His No. 17 jersey hangs in the rafters above the ice at the Air Canada Centre, along with other iconic members of the Maple Leafs pantheon: Johnny Bower, Ted Kennedy, George Armstrong, Red Kelly, Tim Horton, Frank Mahovlich, Börje Salming, and Darryl Sittler. Though he retired from the National Hockey League more than 16 years ago, Clark’s jersey number can still be found on the backs of hundreds of fans on any given game night, not to mention at the three suburban Toronto locations of Wendel Clark’s Bar and Grill. Canadian indie rock veterans Rheostatics immortalized him in “The Ballad of Wendel Clark, Parts I and II.” Clark’s moustache probably has more Twitter followers than you do. So, how does a kid from the tiny farming town of Kelvington, Saskatchewan, become a hero in the Big Smoke? Averaging 35 goals and 246 penalty minutes over your first two seasons in the big leagues certainly goes a long way to cementing your brand. So does punching out the toughest guys on every opposing team. That’s when you aren’t body checking everything in sight with the force of a freight train and self-administering acupuncture needles to relieve the chronic pain caused by your playing style. Canadians are often depicted as a peaceable lot, but we sure love our fisticuffs (see: Domi, Tie) and even the nasty stuff (Bobby Clarke breaking the ankle of Soviet player Valeri Kharlamov in the 1972 Summit Series with an axe-like chop of his stick). We like a guy who can score goals, but we love a guy who can beat the snot out of an uppity opponent. 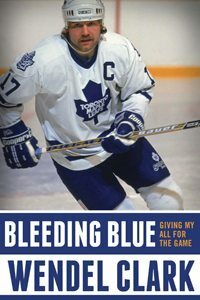 In this breezy memoir, the former first overall pick at the 1985 NHL draft hits all the iconic Canadian hockey notes: playing in the freezing prairie cold; practicing his wrist shot for hours because his dad advised him, as a defenceman, not to take slap shots; leaving home as a teenager to play for the famous Notre Dame Hounds of Wilcox, Saskatchewan; and cruising down Bloor Street in his first car as a pro – a leased blue Oldsmobile Delta ’88. There are some funny set pieces here, like the time cantankerous Leafs owner Harold Ballard got a face full of baby powder after wise-guy teammate Russ Courtnall pre-loaded a washroom hand dryer. Or diminutive superstar Doug Gilmour poking holes in the bottom of styrofoam coffee cups in the dressing room. Or former coach Dan Maloney drying himself with a towel filled with baby powder and Vaseline. But for the most part, the book contains family-rated stuff. Clark is still a Leafs ambassador, so he likely had to be judicious about what to make public and what to keep to himself. This is not a Derek Sanderson tell-all full of hockey, booze, and drugs, nor does it resemble Jim Bouton’s scathingly hilarious baseball diary, Ball Four. But the relative lack of salacious anecdotes is not the biggest drawback in Clark’s memoir. Because media coverage of the Leafs is already exhaustive, there isn’t a lot here that will be new to the book’s target audience. Clark consorted with so many interesting characters – capricious Ballard, grandfatherly King Clancy, explosive coach John Brophy, and super agent Don Meehan among them. His book would have benefitted from a deeper exploration of their influence on him as a player and a team member.